Featuring Starbuck’s tattoo design on the left leg, and the iconic phrase “nothing but the rain” on the right, these leggings are available in either “Blackbird” Charcoal or “Viper” Silver. 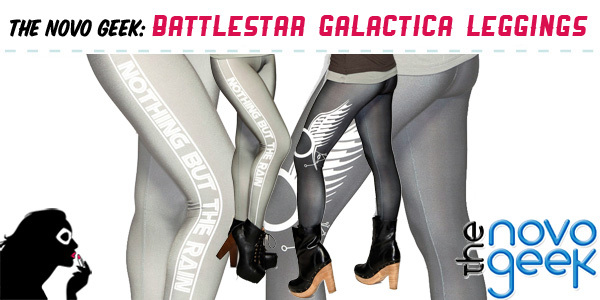 Retailing at $75 and available NOW for Pre-Order, these first-ever officially licensed Battlestar Galactica leggings are sure to satisfy the hunger many fashionable geeks have been feeling. In fact, I know they will. Let me get out of the way the fact that, as impartial as Lindz and I pride ourselves on running and writing this blog, it’s impossible for me not to be *little* biased when it comes to these leggings. Why? Because I designed them. Long before Gold Bubble Clothing became a reality for Jinyo and me, we had come to Anovos (who owns The Novo Geek) with an idea for Battlestar Galactica leggings. They encouraged us to prototype our idea, which we did, and everyone who saw them was very enthusiastic about the design. But without the correct license to legally produce them, they were put to the side. Except when I wanted to wear them for myself, of course. Fast forward to this year’s WonderCon, shortly after The Novo Geek had acquired a BSG apparel license, when I decided to wear the prototype pair out for an evening of socializing. And was practically assaulted by rabid BSG fans excitedly demanding to know where I had purchased them, where they could purchase them, and I’m pretty sure some of them wanted to corner me in the shadows and make off with them. I had forgotten that, as much as I was familiar with these leggings, practically no one knew they existed. Clearly, there was interest. And now there was a license. So it was time to make magic already! You might be asking yourself why it’s necessary to bother with the back story of these leggings. I think it’s important to illustrate not only how much companies like Anovos/The Novo Geek care about the fans and its customers, but also what’s possible when any passionate fan, whether it’s me or you, puts their mind to something. When companies have a “by fans, for fans” mentality, they really mean it! And here’s the proof. What is the inseam length of the leggings? They are awesome btw.